The Doctoral Program was established in 2005 and was incorporated into the Department of Information Management in 2008. There are 25 faculty members in the department, including 5 professors, 13 associate professors, 6 assistant professors, and 1 lecturer. Over 95 percent of the faculty members hold doctoral degrees from major universities of Taiwan, UK, North America, and Australia. The academic and professional strength of the faculty and on-going investment in computing resources have enabled the department to broaden its course offerings and increase the research achievements to meet the demands of the students, business, and academia. According to 2014 Elsevier statistics, CYUT was ranked as world #1 based on the global journal paper impact in the combined fields of computer science and decision science. Our doctoral graduates have plentiful employment options. The technologies they learn can be applied to the industry and help the employers become more competitive. Otherwise, they may go into the academia to provide their research capabilities. Some of our doctoral graduates either join the education field, or are dedicated to the training of Information and Communication Technologies. Founded in 1994, the IM department began with the undergraduate program. In 1997, the graduate institute of the department was established. And the Ph.D. program was added to the IM department in 2005. Since then, the department offers a complete set of degree programs in the professional education and academic research. Presently, the department has approximately 850 undergraduate students, 80 graduate students, and 25 faculty members, 24 of them having Ph.D. degree in the related fields. For further development, the undergraduate program in the IM department is divided into two specialized programs: The Information Management Program and the Digital Multimedia Program. With the past fruitful academic and professional achievements, the IM department has put its efforts on revising curriculum and updating equipment to meet the needs in both professional education and academic researches. The IM department believes that the revise and update actions will benefit the students to meet increasing demand on their career. Moreover, strong professional development of faculty members is another strong key factor for better and competitive development of the department. 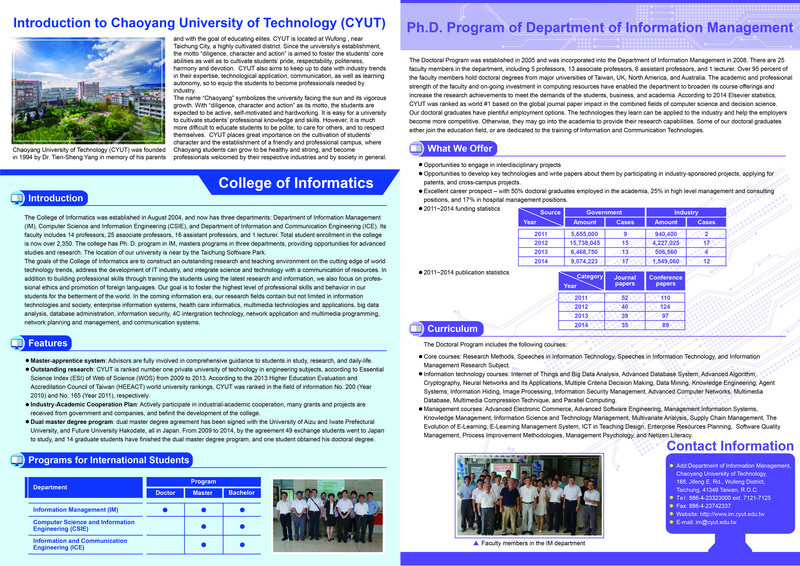 Currently, the main researches of faculty members include information technologies and society, enterprise information systems, health care informatics, multimedia technologies and applications, big data, database administration, and information security. 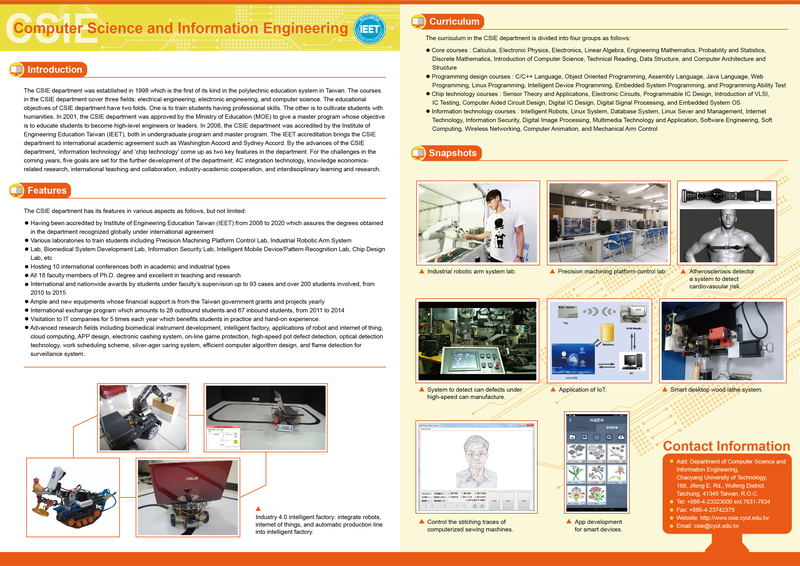 The CSIE department was established in 1998 which is the first of its kind in the polytechnic education system in Taiwan. The courses in the CSIE department cover three fields: electrical engineering, electronic engineering, and computer science. The educational objectives of CSIE department have two folds. One is to train students having professional skills. The other is to cultivate students with humanities. In 2001, the CSIE department was approved by the Ministry of Education (MOE) to give a master program whose objective is to educate students to become high-level engineers or leaders. In 2008, the CSIE department was accredited by the Institute of Engineering Education Taiwan (IEET), both in undergraduate program and master program. The IEET accreditation brings the CSIE department to international academic agreement such as Washington Accord and Sydney Accord. By the advances of the CSIE department, 'information technology' and 'chip technology' come up as two key features in the department. For the challenges in the coming years, five goals are set for the further development of the department: 4C integration technology, knowledge economics-related research, international teaching and collaboration, industry-academic cooperation, and interdisciplinary learning and research. With the rapid development of Information and Communication Technology (ICT) and the urgent need of the market, ICT plays an important role in the development of the industry. The ICE department began with a master program in August 2002. Then the undergraduate program was inaugurated in August 2007. 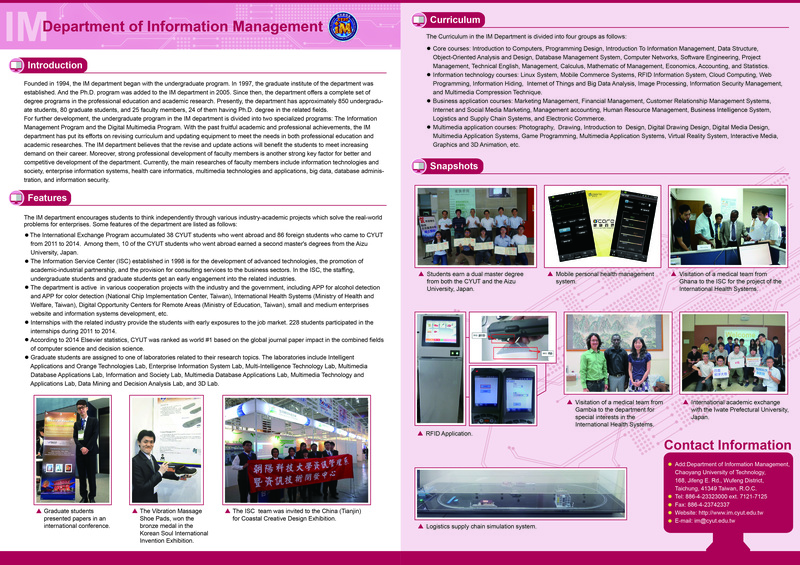 The curriculum of ICE department emphasizes on two fields: 'Information network' and 'Communication system'. 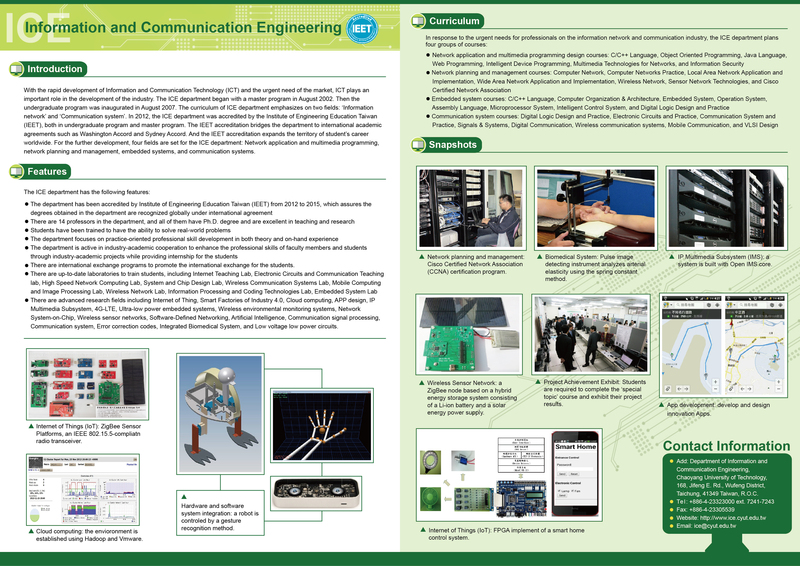 In 2012, the ICE department was accredited by the Institute of Engineering Education Taiwan (IEET), both in undergraduate program and master program. The IEET accreditation bridges the department to international academic agreements such as Washington Accord and Sydney Accord. And the IEET accreditation expands the territory of student's career worldwide. For the further development, four fields are set for the ICE department: Network application and multimedia programming, network planning and management, embedded systems, and communication systems.